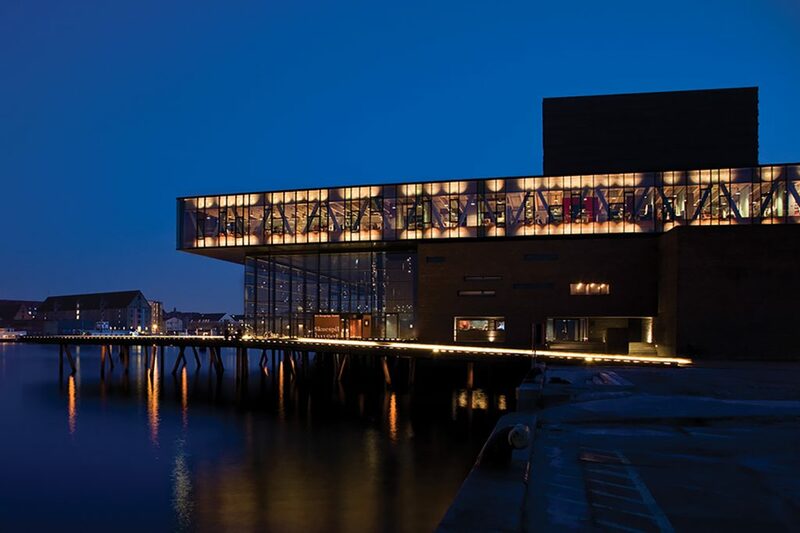 The foyer at the Royal Danish Playhouse is a good example of how light can support the architectural visions. One of the architectural conceptual ideas is that the foyer and harbor promenade is experienced as one. The task of light was therefore to make the glass facade invisible. The location of the light sources in the foyer and their direction, hue and brightness is therfore designed not to illumine people to avoid reflections in the glass facade. Thus the view of the dark harbor is not disturbed. The light in the foyer is mainly derived from fiber optic light (lianas) hanging from the ceiling supplemented with theater spotlights. The project was awarded with The Danish Lighting Award and the Nordic Lighting Award of 2008.